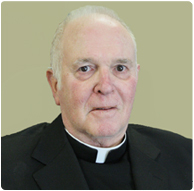 Redemptorist missionary, superior, administrator, and pastor Father John Louis Smyth, remembered as a tenaciously hard-working priest, died on November 3, 2011 surrounded by his confreres at their religious community in Stella Maris in Timonium, Maryland. Father Symth was born in Pittsburgh, Pennsylvania on March 13, 1938 and professed his first vows on August 2, 1959. He was ordained a priest on June 21, 1964. He is survived by his sister, Mrs. Lois Semplice and several nephews and nieces, and was predeceased by his mother, Mrs. Viola Smyth and sister, Mrs. Gail Tometesko. His first assignments required him to learn Portuguese so that he could minister and preach in Campo Grande, Brazil. He began working in Guaratuba as a young Father in 1966. He continued to serve in South America for the next nineteen years in Ponta Pora, Aquidauana, Tibagi, and Ponta Grossa. In 1985 he returned to the United States and was appointed to the Baltimore Province Missionary Team. He preached numerous parish missions along the entire east coast from Maine to the Caribbean. Then in 1995 he was transferred to the Vice-Province of Richmond where he served in St. Francis by the Sea Parish in Hilton Head, SC., Sacred Heart Parish in Griffin, GA., St. James Parish in Concord, NC., St. Alphonsus Retreat Center in Venice, FL., St. Michael’s Parish in Wauchula, FL., and Sacred Heart Parish, in New Smyrna Beach. He was the last superior appointed to the Holy Family Retreat House in Hampton, VA. In addition to these varied pastoral responsibilities he also served the Vice-Province in an administrative capacity as a Consultor and Vicar. May his soul be at peace in this union forever.